The DeLonghi Dual Zone Deep Fryer has an extra large 3-LB. (4-LITER) food capacity. Ample space allows food to fry evenly and completely, for delicious results every time. 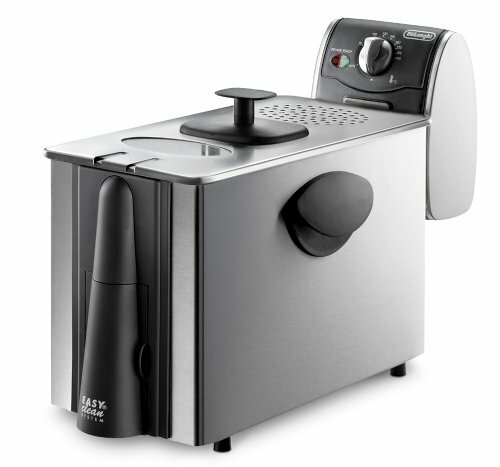 Its generous capacity makes the Dual Zone deep fryer perfect for meals and families of all sizes. Dual Zone Technology- The cool zone located beneath the heating element, prevents food from burning. This unique technology reduces odor and keeps oil clean, for tasty fried food every time. The adjustable thermostat with Indicator light, lets you easily set the temperature, giving you the flexibility to fry foods just the way you like them. Removable parts Make cleanup quick and effortless. The bowl, frying basket and lid are all dishwasher-safe. A permanent mesh filter is located inside the stainless steel lid, the permanent filter prevents the release of oil vapors and odors into your kitchen. The viewing window allows you to safely and easily view the entire frying process. A removable heating element allows for quick and easy cleanup, and it's in direct contact with the food for fast and crispy results. Cool Touch removable handle lets you lift or lower the frying basket for safe operation. I bought this deep fryer to replace my old one that was taking way too long to deep fry anything. I bought this deep fryer to replace an ancient Tefal unit that had finally gotten too gross to use. The DeLonghi deep fryer suprised me initially, because it is so much smaller and lighter than the Tefal, but it has turned out to be a great appliance for me -- although I'm not cooking for a family, the capacity is at least as good as the Tefal it replaced. The best thing about the DeLonghi is that it is much easier to drain when cooking is over, and so much easier to clean that it's difficult to credit. The deep frying unit is an immersion heater rather than a built-in heat supply and the entire deep fryer breaks down into components that are very easy to wash thoroughly. There are no hinges or any other crannies to trap grease. The unit is easy to set up and use. It doesn't have a lot of extra features, but it really cooks the heck out of fries and tater tots. The dual zone works great at preserving your oil. The little bits and pieces that fall off sink to the bottom, and do not stay in the heated area, which would cause smoking and oil deterioration. Draining the oil was easy, too. Just position a large enough container below the fryer, open the little door (which seems to have a hard time staying closed), and open the valve to drain the oil. Wipe out the crumbs from the bottom of the pan, refill and you are back in business. I purchased this about 3 weeks ago. Used it for the first time last night. It was easy to set up, easy to read markings on the inside for oil fill levels. Green light lights up when oil is at temperature. I checked the temp with my thermometer and it was within 7 to 10 degrees of the temperature I set. We made fried chicken strips, they were crispy and not a trace of grease to be tasted. Even left over cold for lunch today they were great. Cleanup was a breeze, I used a roasting pan placed upside down on the counter near the sink, placed fryer on top of roasting pan, put the empty oil jug in the sink and drained the used oil back into the jug for another use later. All of this was done after the oil had cooled so as not to melt the plastic jug. The entire fryer then comes apart so the parts can be washed or wiped down. Great Fryer. Highly recommended.